This essay is Part I of a two-part series by Betsy Warner about her experiences as an educator and an activist. Education is political. Most educators stray away from that idea, but it is. In the curriculum and in the choices we make about what to teach and how to teach it, education is political. And, for the most part, our country’s curriculum is white (not to ignore the educators and programs out there who are teaching a more comprehensive program). Our nation’s curriculum primarily presents people of European descent, and specifically men, as the movers and shakers in history, math, science, literature, art, and music. I teach eighth grade and in conversations with students of Puerto Rican, Dominican, Mexican, and Guatemalan roots, each one shared that they had never in their previous eight years of educational experiences learned about people who looked like them. I repeat, never, in their entire education so far, had they learned about people who look like them. One young man lamented that he didn’t want his younger sisters to have the same experiences in school because it made him feel like he and his people don’t do anything. Not only does this disempower students of color, it’s deceitful. Check most of your history textbooks and you’ll find that most of them depict Christopher Columbus as an exploring hero who discovered new lands, a narrative that holds little to no regard for the indigenous peoples who already lived there and the atrocities committed against them. Further, students are not taught about the accomplishments and contributions of indigenous peoples before their lives, culture, and land were almost destroyed by colonialism. For example, the brilliancy of the Incan irrigation system for growing their crops or the complex record systems of the Mayans that allowed for them to predict astronomical events thousands of years ahead of their time. As educators, we need to be critical and thoughtful of not only what we teach, but also how we teach it. Not only do we need a shift away from a Eurocentric curriculum, but also a centering and empowering of student voices, especially marginalized ones. Machu Picchu. Courtesy of Perouvoyage.fr. Some of the dangerous effects of teaching a primarily white curriculum are extremely visible in today’s political climate as the current leader of the country and his supporters attempt to define who “belongs” here and who doesn’t, seemingly unknowing or uncaring of the fact that we are all on stolen Native land. While these messages have been very explicit in our current political climate, these ideas have always been latent in our society. To defend against these messages and express solidarity with those attacked, my students created posters during the election affirming that Native, Immigrant, Black, Muslim, LGBTQ+, Women’s Lives Matter, and that they will not tolerate hateful ideas, messages, and discrimination. The next day, another educator brusquely ripped every poster off the walls, declaring that education is not political, even though her own actions were. Education always has been political. 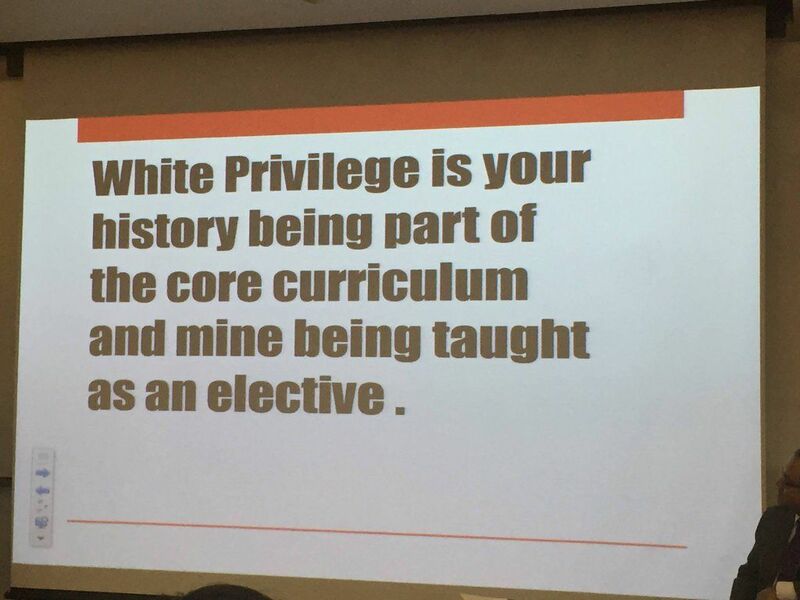 I think we as white educators don’t recognize that because we are accustomed to education reflecting and benefiting our experiences, and continuing to ignore that will do nothing to break down white supremacy. Especially and specifically in our current political climate, if you are not addressing hatred and racism and the historical and systemic foundations of each, your silence is political. There is no neutral. This is more than just politics. These are issues of right and wrong, truth and lies, and humanity itself. There are a wealth of resources with information on how to talk to and work with students: Southern Poverty Law Center, their educational program Teaching Tolerance, the American Federation of Teachers, Zinn Education Project, Rethinking Schools, and more. Google it. Use social media. Find resources. There is no neutral. This is more than just politics. These are issues of right and wrong, truth and lies, and humanity itself. Students need an understanding of the depth and breadth of systemic racism in America. Not just the torch-holding, flag-waving, shouting-in-your-face racism, but the systemic racism present in our institutions, our societies, and even in our schools. Students need an understanding of how to combat and dismantle it. This means educating and empowering them. Now more than ever. Betsy Warner is entering her sixth year as a teacher. She believes in educating and empowering students and will continue to do so.